Ms. Pacheco has been practicing for over 15 years. She has conducted jury trials and bench trials. After litigating insurance defense cases for almost eight years, she has focused her area of practice in Family Law for the past nine years. 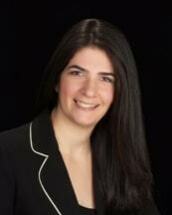 Ms. Pacheco is well versed in the areas of divorce, child custody, child support, and domestic violence. She also handles high conflict and high asset cases. Ms. Pacheco also serves as a Guardian ad Litem, representing children in contested custody cases. She is also certified by the Supreme Court of Florida as a family mediator and is a parenting coordinator.